The East Bay oil giant rakes in huge profits and demands that the rest of us pay a steep price. Plus, state health officials warn not to eat oysters from a company backed by DiFi. Chevron Corporation reaped $26.9 billion in profits last year. That's right: $26.9 billion. Yet for reasons still to be explained, the San Ramon-based company declined to spend any of that cash on replacing a small, aging section of pipe at its Richmond refinery during an inspection last fall. Last week, that eight-inch pipe began to leak oil profusely before igniting a fireball that could be seen throughout the Bay Area and unleashing a giant plume of smoke that sickened hundreds of nearby residents. But Chevron's greed, and its accompanying cavalier attitude toward environmental health, is not relegated to ignoring old leaky pipes. For years, the oil giant has been trying to stiff East Bay taxpayers. The company has repeatedly filed claims with Contra Costa County officials, contending that tax assessors had overvalued its Richmond property, and that, as a result, its local property tax bill should be much smaller. In 2009, Chevron won one such claim — thanks in part to a county appeals board member who did not disclose that he also had financial ties to the oil company (see "A Friend of Chevron Gives It a Costly Gift," 10/9/2009). That appeals-board decision forced Contra Costa County to pay Chevron a $12.6 million refund, and resulted in county officials having to drastically cut public services even more than they already had done. Yet even with that windfall, Chevron was unsatisfied. So the company pressed forward with demands for more multimillion-dollar refunds. However, the appeals board, thanks to new members who have no ties to Chevron, ruled against the oil giant earlier this year. Chevron, however, has yet to pay all the taxes it owes. 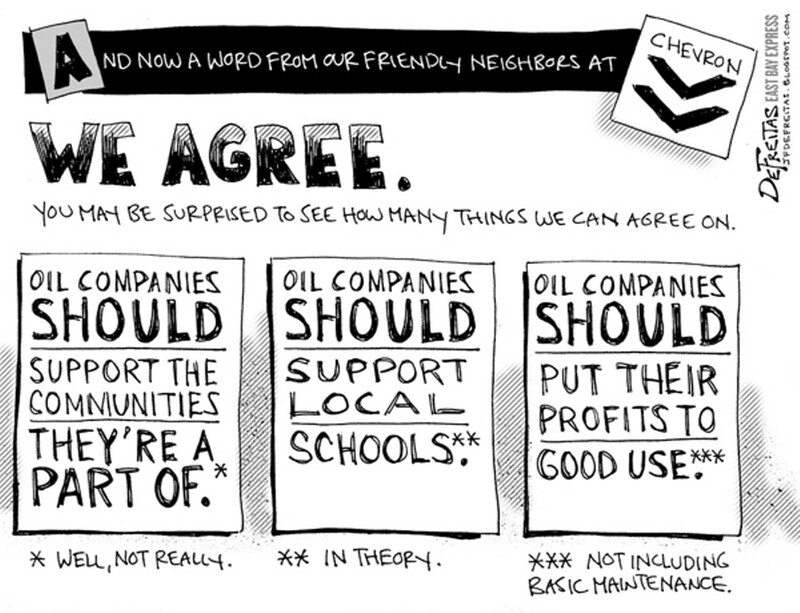 As such, Chevron exemplifies what is wrong with modern America. Most of us must pay our taxes, and thus do our fair share for the public good, while large corporations and wealthy individuals don't have to. For them, all that matters is accumulating more riches — even if it comes at the expense of the environment and public health. It should also come as no surprise, then, that Chevron may not suffer much financially from last week's massive fire and explosion. Gas prices immediately spiked after the incident because of a "fuel shortage" caused by the shutdown of the Richmond refinery. In other words, even when Chevron loses, it still wins. Bay Area news reporters have generally done a good job so far covering the Chevron explosion and the reasons for it. But as noted by the nonprofit Environmental Health News earlier this week, some news outlets, including the San Francisco Chronicle, have given short shrift to the damaging effects to human health posed by particulate matter from smoke. The massive plume from the Chevron explosion last week strongly suggested the presence of particulate matter, and may explain why so many people sought medical care in the hours and days after the incident. Research shows "there is strong epidemiological evidence from around the world" that exposure to particulate matter — such as that produced by the smoke from the fire — "has been associated with respiratory problems that include asthma attacks, coughing, chronic bronchitis, and shortness of breath," Environmental Health News reported. Research also has revealed that the number of heart attacks often increase when particulate levels rise. Moreover, health problems from particulate matter can result in hospitalizations and emergency room visits, and even lead to premature death. Remember that oyster farm we've been writing about — the one US Senator Dianne Feinstein has been backing so strongly? Well, late last week the California Department of Public Health issued a bulletin, warning consumers not to eat oysters from that farm — Drakes Bay Oyster Company — because they may contain bacteria that cause serious illness. Drakes Bay Oyster Company has been locked in a nasty dispute with the National Park Service over its oyster farm at Point Reyes National Seashore. Feinstein wants the federal government to extend the oyster farm's lease at Drakes Estero in Point Reyes — a move that would be unprecedented because Drakes Estero has been designated by Congress to become the first marine wilderness on the West Coast (see "Feinstein's Folly," 6/13). In an August 10 statement, California health officials said that oysters from Drakes Bay Oyster Company had sickened at least three people. The oysters contained the bacterium Vibrio parahaemolyticus. "Symptoms of Vibrio parahaemolyticus infection include vomiting, abdominal cramps, watery diarrhea, headache, fever, and chills," the statement read. "Most infected people recover without treatment in a few days. Severe illness and death from Vibrio parahaemolyticus infection is rare, but can occur with chronic liver disease, cancer, or other conditions that weaken the immune system." Drakes Bay Oyster Company, the largest supplier of oysters in California, has already initiated a voluntary recall of shucked and in-shell raw oysters. "The shucked oysters are packaged under the Drakes Bay Oyster Farm label and sold in 9 ounce, 1-pint, 1-quart and half-gallon jars, or tubs," the health department stated. "The affected shucked products are labeled with lot numbers 363 through 421. The lot number can be found on the top label of each jar or tub. The in-shell raw oysters are sold individually or in bags ranging in size from 1 dozen to 10 dozen. In-shell raw oyster tags are marked with harvest dates ranging from July 17, 2012, through August 8, 2012." The state health department posted a complete list of the suspect oysters from Drakes Bay on its website. Health officials also recommended that consumers experiencing any ill effects after eating the oysters should consult their health care providers. Also, people who notice Drakes Bay Oyster Company oysters being offered for sale should call the California Department of Public Health at 800-495-3232. The health department bulletin and the recall could deliver a debilitating blow to Drakes Bay Oyster Company, which has been under fire from environmentalists for repeatedly violating state environmental laws at its Point Reyes oyster farm. At the same time, the business, with Feinstein's help, is attempting to convince US Interior Secretary Ken Salazar to set aside precedent, block creation of the marine wilderness, and extend its lease for another ten years before it expires this November.